Suhita Nadkarni is a neuroscientist at IISER Pune leading a generation of computational neurobiologists. She started off as a physicist but her Ph.D. introduced her to studying the brain by computationally modeling communication between brain cells. “I started off tackling my research questions from the lens of a physicist and a modeler, but [neuroscience] meetings made me realise the value of being an insider — being a neurobiologist rather than a physicist trying to understand the brain,” she says. In this podcast, Suhita talks to Dnyanada Gokhale about her formative research years at the “hotbed for neuroscience research” in the world, how she brought Parle G biscuits to the tea culture at the renowned Salk Institute and her approach to teaching and doing neuroscience in India. Suhita represents the new crop of young Indian interdisciplinary scientists who refuse to suffer through the slow and bureaucratic approach to science that has been the norm in India. Last year she organised the first meeting for Indian neuroscientists named “No Garland Neuroscience”. This scientific meeting she insists is a ‘workation’ and encourages participants to bring their families along to future events. Aparna Mukherjee is a clinical researcher working at the All India Institute of Medical Sciences, New Delhi. She has been studying and working on tuberculosis as a doctor and researcher for over ten years. She specialises in the field of paediatric tuberculosis and is working on developing blood-based tests to monitor the outcome of treatment in young patients. In this podcast by The Life of Science, she talks to Adita Joshi about her current research and her transition from being a clinician to a researcher. She explains the differences between adult and paediatric TB, and why a unique approach is needed to diagnose as well as treat young TB patients. After completing her MBBS from Medical College, Kolkata, Aparna went on to pursue paediatric medicine for her postgraduate specialisation. It was during this time that she got a taste of research and enjoyed it. This encouraged her to look for research opportunities in Delhi instead of following the conventional path of residentship after her MD. She joined as a research officer in the department of paediatrics and soon signed up for a PhD in the same department. Aparna finds her clinician-scientist career path highly satisfying and hopes her work will inspire a few medical students to come and join the research bandwagon. Read the full interview with Aparna here. In this podcast, she talks to Shraddha Nayak about her life in science and her hope for the future of the Indian scientific scenario. Read our detailed interview with Sreelaja here. Sandhya Visweswariah is one of the few women on top in Indian science. Her work on a molecular receptor for a toxin behind several types of diarrhoea has come a long way since she started her scientific adventures with a pharmaceutical company. Sandhya and her team at the Indian Institute of Science (IISc) have done extensive research on the receptor and its molecular pathways. Sandhya has been part of sexual harassment cell and the women’s cell at IISc, and has taken steps to forward the cause of closing the gender gap in Indian science. She says that not much can be done unless leadership at institutes insists on ensuring equal representation of women. She adds that dealing with sexual harassment cases might be too slow. She was also recently elected as one of the 55 fellows of The World Academy of Sciences for the advancement of science in developing countries. Indumathi is a particle physicist at The Institute of Mathematical Sciences in Chennai. She works on mysterious sub-atomic particles called neutrinos. Indu is pushing for an underground neutrino observatory – a project that has been dogged by controversy ever since its conception. In this episode, she talks about the science of neutrinos and why we must not be afraid of them. 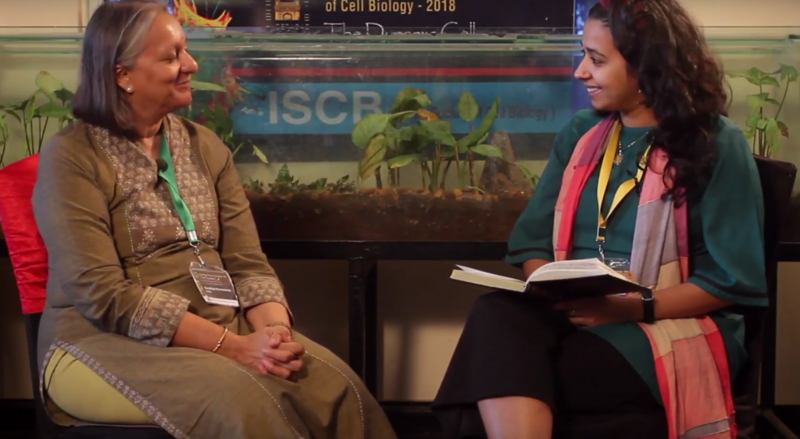 A conversation with one of the very few women leaders at Benaras Hindu University who is an award-winning biotechnologist. Kavita has had a long journey at BHU starting with her PhD and then returning to set up a laboratory from scratch at one of the oldest and tradition wrapped universities of modern India. She opens about how she had made it this far and her current work in environmental biology for which she holds multiple patents. Smitha Hegde is one of the country’s topmost experts on one of the earliest land plants to appear on Earth – ferns. Based in Mangaluru, the pteridologist studies the evolution of ferns in the Western Ghats. In this episode, she talks about a problem in Kudremukh National Park that she was called upon to deal with. Read our detailed interview with Smitha here. Anu Sabhlok is a social scientist, architect and feminist scholar at IISER Mohali. She has been relooking the definition of “nation” with the help of migrant labourers who build India”s border roads every year. For many years she has been travelling with the labourers as they build the Indo-Tibetan border roads and then back again to their homes in central India. Her research reflects the realities of contemporary India. Read our detailed interview with Anu here. Read our detailed interview with Vidita here.